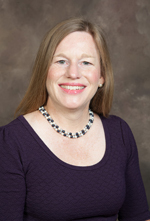 Dr. Amy Hall is a Professor of Nursing and the Dean of the School of Nursing at Franciscan Missionaries of Our Lady University in Baton Rouge, Louisiana. She currently leads faculty, students and staff in the BSN, RN to BSN, MSN FNP, and DNP Nurse Anesthesia programs. Dr. Hall earned her BSN and PhD in nursing from Saint Louis University and her MS in nursing from the University of Illinois-Chicago. Dr. Hall has expertise in curriculum design, program evaluation and nursing leadership. She has taught international students and study abroad courses in a variety of countries including England, China, and the Dominican Republic. Dr. Hall also consults with other nursing programs in designing and implementing curricular change and designing effective program assessment and evaluation plans. Dr. Hall has served as an ACEN site visitor since 2008, a team chair since 2011, and an ERP member since 2012. She was the chair for the 2017 ACEN Standards Revision Subcommittee for baccalaureate and higher programs. She is a member of several professional associations including Sigma Theta Tau International, the National League for Nursing, and the American Diabetes Association. A certified disaster nurse, Dr. Hall is an active volunteer with the American Red Cross, caring for people affected by disasters and providing disaster nurse certification courses for other nurses. When she is not spreading her passion for nursing and nursing education with others, Dr. Hall co-authors two nursing fundamentals textbooks and enjoys cooking, baking, and running marathons.